It's the largest gambling destination in the United States. It's a huge city and resort, but it's located in the middle of the biggest desert in Nevada. Over 40 million tourists visit Las Vegas annually, and they spend almost $10 billion a year gambling. How did a town of railroad workers and ranchers become the casino capital of the United States? In terms of drama and interest, the history of Las Vegas equals or surpasses the history of any other city in the country. You can find out more in this article, which covers everything you could want to know about how this city developed. 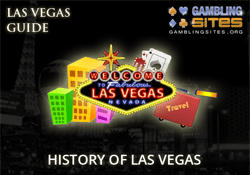 Most histories of Las Vegas focus on the town from its inception in 1855. We'll get to that, but it's appropriate to include some information about the area before then. After all, archaeological evidence indicates that humans have been in the area for over 10,000 years. More specifically, in 8th century, the Paiute tribe lived in the area. These indigenous people refer to themselves as "Numa", which means people. They also call themselves "Nün'wa Paya Hup Ca'a' Otuu'mu". That translates to "coyote's children living in the water ditch". Some of the Paiute still live in the area on reservations. Many Anglo-centric histories would more likely begin their history of Las Vegas with the arrival of Rafael Rivera in 1829. He's the first European to have visited the Las Vegas Valley. He was scouting the area for Antonio Armijo, who was exploring the area in order to open the Old Spanish Trail (a trade route) between New Mexico and California. It was Rivera who named the valley Las Vegas. It means "the meadows". He named it so because of the grasses there that were watered by the valley's springs. In 1855, Brigham Young sent a Mormon expedition of 29 missionaries to found a settlement there. This settlement failed by 1857. The heat and difficulty growing crops was too much for them, but they did leave behind a fort. A prospector named Octavius Gass took over the fort in 1865 and called the area "Los Vegas Rancho". He was afraid that people might confuse the locale with Las Vegas, New Mexico. Gass was an instrumental figure in the early history of Las Vegas. He and his partners, Nathaniel Lewis and Lewis Cole, bought the rights to the property and repaired the fort, which had fallen into disrepair. Seven years later, in 1872, Gass bought his partners out and owned a 640 acre ranch there. He and his partners raised cattle and horses. They also farmed barley, oats, wheat, and melons. Eventually they planted orchards, too, growing apples, apricots, figs, and peaches. Gass and his family left Las Vegas in 1881, when they moved to Pomona, California. Archibald Stewart took over the ranch and increased its size to 1800 acres. It stayed in the Stewart family even after Archibald Stewart's murder in 1884. By 1895, the Mormons began migrating to the area. In 1902, the San Pedro, Los Angeles, and Salt Lake Railroad bought the ranch in order to ensure they could finish building their line. William Andrews Clark, the Senator from Montana, was instrumental in the railroad project and the development of the area. This development included digging wells. For the next two decades, agriculture was king in the area. The grateful farmers in the area named it Clark County in his honor. The railroad was completed in 1905, and this represents the beginnings of the Las Vegas we now know. During this time period, there were actually two separate towns called Las Vegas. One was owned by William Andrews Clark, a US senator. This was the east side of town, which is now The Strip and Downtown Vegas. But J.T. McWilliams owned the other town, which is the west side and is now located north of today's Bonanza Road. As was so often the case in American expansionist towns, the real boom came from increased railroad access. When Senator Clark had another railroad built branching off from his Las Vegas to a little boomtown called Bullfrog, he unwillingly created an intersection fed by revenue from not one but two rail stops. The resulting boom would blend the two cities into one. And on May 15, 1905, Las Vegas was founded by the auctioning of 110 acres of what we now call downtown to private buyers. Just a few years after the founding of what would one day be the ultimate gambling destination, the State of Nevada became the last state in the West to outlaw gambling. Nevada's new anti-gaming laws were incredibly strict, forbidding even a wager on the flip of a coin. Las Vegas was booming in those days, completely free of all legal gambling, with a robust economy based mainly on the raising of livestock, the provision of water, and the railroad. That prosperity lasted until the beginning of World War One in 1917. The war forced the government to redirect funds and sent this part of the West into an economic tailspin. One of Clerk's railroads, the Las Vegas and Tonopah, declared bankruptcy. Then, in 1922, a massive railroad strike crippled the city. The years of the Roaring 20s were lost on this part of America. While Atlantic City was enjoying its heyday, people in Las Vegas were out of work and running low on what natural resources existed. Even the weather rebelled against human occupation – between 1923 and 1929, Las Vegas had six of its hottest years on record. But the decade that should have been a death blow to the city turned out to be its salvation. In July of 1930, President Hoover signed an appropriations bill that would lead to the building of what was then called the Boulder Dam. The massive concrete structure was larger than anything built in modern history, and was expected to be a huge boon to the area, providing new irrigation lines as well as hydroelectric power and flood-control capabilities. - The catalyst for Las Vegas and still a major tourist attraction today. Las Vegas lucked out because of the city's proximity to the site of the dam, just thirty miles away from modern-day downtown. Immediately, the population of the city climbed from around 5,000 citizens at the lowest point in the recent depression to 25,000. Men flooded in from all over the country expecting a job on the dam project, and most of them got just that. How did the Boulder dam (which would be renamed the Hoover dam some years later) contribute to the development of Las Vegas as a playground? Imagine twenty thousand working-age men from all over the country converging on a tiny railroad town in the middle of the desert. Overnight, an entertainment industry was formed. These men worked hard and played harder – but there were few places to play in the formerly sleepy railroad depot town. It didn't hurt the town's prospects that the US government spent $50,000,000 in the town within the course of eight years. Real estate boomed. Night clubs, speakeasies, and casinos blossomed. Sin City was born in the name of separating dam workers from their hard-earned checks. Though the government built Boulder City to house the dam workers (and separate THEM from Las Vegas), the cat was out of the bag, and Las Vegas was soon the new capital of illicit gambling. Vegas was thriving, but the state of Nevada still had problems. Nevada was having a hard time attracting permanent settlers. The state's harsh climate and geography will never be most American's idea of a good place to live, and the same was true then. The state legislature was desperate to make a change that would attract new residents. So they legalized gambling and divorce. When the state legislators saw what happened in Las Vegas in the course of just a few years, they realized that this gambling thing could be highly profitable, both for their coffers and for local businesses. Once gambling was legalized, the city of Las Vegas (which had a tiny but established and well-known gaming industry), was automatically crowned the gambling capital of the country. Clark County issued its first gambling license in 1931, to a venue called the Northern Club. Other casinos started popping up on the same street as the Northern, and soon Fremont Street was the center of the gaming universe. Fremont would soon become the first paved street in the city with the city's first traffic light. With the completion of the Boulder Dam in 1935, and the opening in 1937 of its first power plant, Las Vegas had an awesome supply of inexpensive power to light its burgeoning nightlife and gambling scene. Though the crowd of dam workers eventually disappeared, they were soon replaced by tourists visiting both Hoover Dam and the lake (Lake Mead) that the dam created. Now that crowds of average Americans were coming to the city (bringing with them the spoils of the new middle-class lifestyle), Las Vegas needed to class things up a bit. The city responded, building fancier hotels and accommodations. Two major highways were built to access the city, making it easily-accessible by car for the first time in history. Around this time what we now call the Vegas Strip was born. The El Rancho Vegas Resort was built on land that would today be located right in the middle of the Strip. The El Rancho was famous for – what else? – Its inexpensive buffet. The years of 1952 to 1957 were big years for Las Vegas. Tons of money (much of which was provided by the Teamsters Union, some of which came from bankers affiliated with the Mormon Church) flowed into the city, and casinos went up faster than toadstools after a rain. The Sahara, the New Frontier, the Sands, the Royal Nevada, the Showboat, the Riviera, Binion's Horseshoe, The Fremont, and the Tropicana were all built during this five-year period. There was good reason for all these casinos opening. By 1954, millions of people were visiting the city each year, spending $200 million in the area. That's the equivalent of $8.8 billion today. Any time Americans mass in one area and start spending money like that, you're going to see rapid development. That's just what happened in Vegas after World War II. The ties between organized crime and Las Vegas' profits didn't go unnoticed by the federal government. Though Las Vegas was developing a family-friendly image (aided by regular performances by celebrities like Frank Sinatra, Elvis Presley, Andy Williams, and Carol Channing), attempts to pass federal gambling controls were frequent and vigorous. Through political machinations, the founders of the city and its gambling interests were able to avoid a federal crackdown. If the hundreds of millions of dollars rolling into town during the 1950s was a flood, then the kind of money the city would see during the 60s and 70s was a waterfall. That waterfall started in the mid-60s, when the eccentric businessman and filmmaker Howard Hughes started buying up casinos, resorts, and other property in the city. "Said to have spent half a billion dollars on Vegas real estate ($10 billion in today's money)." Mr. Hughes' money (and the money of the investors and developers who followed him) had a major influence on the city. Gone were the days of Vegas as a brassy Wild West frontier city. Vegas was starting to look modern, sleek, bright, and efficient. Sure, some of the trappings of frontier Vegas can still be seen today, but without this "growing up" period during the 1960s, it's unlikely that Vegas would today be the home of infinity pools, penthouse suites, and magnums of rare Champagne. Between the year 1970 and 2000, Las Vegas was the largest city founded in the 20th century. It was a modern city, a population center that experienced population growth for a solid century, and a "happening" place to hipsters and squares alike. Even a nationwide birth rate decrease in the 1970s didn't stop Las Vegas from swelling in population, growing by at least 60% each year for forty years in a row. In the 1980s, the long (and sad) decline of Las Vegas began in genuine. The World War II generation were dying off or becoming too old to travel to a gambling hotspot. Organized crime, which had so long financed, protected, and powered the city, was falling apart. Baby boomers were rejecting the Vegas of old in favor of something modern. That thing was the mega-resort. The mega-resort not only made Vegas even wealthier, but it turned what had been a somewhat seedy adult playground into a commercialized and family-friendly venue with a little bit of gambling on the side. Steven Wynn's Mirage (built in 1989) was the first of these, a 3,000+ room monster of a hotel and casino, featuring gaudy gold-tint on the windows and a massive casino floor. Tourists loved it, Steve Wynn made a mint, and nineteen other megaresorts would open over the next two decades. The Rio, the Excalibur, MGM Grand, Bellagio, Mandalay Bay, Palazzo, The Cosmopolitan … these are the new names made popular in the new Las Vegas. Mega-resorts with thousands of rooms, dozens of restaurants and bars, attractions designed to keep guests on-site, and usually some sort of visual gimmick. From the dancing fountains of the Bellagio to the giant pyramid shape of Luxor, it seems like every new Vegas gambling venue has to incorporate some sort of impressive structure. All through the 1990s, Las Vegas seemed to be a town on the up and up. Rumors of professional sports teams moving to the city never seemed to materialize, but were always just around the corner. Then came the 2000s, and the second great decline in the Las Vegas economy. What (almost) killed Las Vegas? A minor recession in the early 2000s followed by a major home mortgage crisis and a lengthier recession later on in the decade. Home construction stalled altogether. Major construction projects were cancelled or junked. Gaming and tourism revenue dwindled to its lowest levels in decades. The first major net losses were reported in 2006, and didn't improve for five years. Take a look at the giant (dark) tower of the Fontainebleau hotel, which was under construction when the crisis kicked off and has never been finished. It's one of several blights on the landscape of the city that don't appear to be going anywhere fast. Now that the recession is over, tourism has increased, and by all reports, the Vegas housing market is back, too. Las Vegas is experiencing a turnaround in fortune, though it may be too soon to celebrate. After all, the city is still sitting at 10% unemployment, which is among the worst rates for cities of similar size. What can be done to save Vegas? Like Atlantic City, Las Vegas needs to find some new sources of revenue to diversify. Depending on gaming income isn't smart – the city almost collapsed when that revenue dried up just seven or eight years ago. Concerns about a changing climate and its impact on tourism dollars is even further evidence – if Las Vegas can't find a new industry to replace suspect gambling income, it may be a relic of the 20th century. The story of Las Vegas is a classic American tale. You'd never expect a dumpy railroad depot, passed over due to failing mineral rights, to one day be the epicenter of glitz and glamour – but that's what happened. We love the stories of Las Vegas: the rags to riches tales of small-time bettors hitting a big jackpot, the Mafioso-infused celebrity parties, even the myths about tough bookies and casino bosses cutting off digits to settle debts. But once you know the real history of the place, you'll see that truth really is stranger than fiction. If you're planning a trip to Vegas any time soon, make sure and make time for a little historic exploration. The city is a lot more interesting than its neon lights and dancing fountains suggest.